There has always been a passage in the Declaration of Independence that has rung very deeply in my spirit. It was the thought of the revolutionary fathers, in giving an explanation and reason to the world for undertaking, to set up a new government among the families of nations. They said something like this: “Out of due respect for mankind, they felt it necessary to give a reason for such an act.” As we invite this company of people together in this section of the country, I feel that a due word of loving explanation may be helpful. I have been in this particular manner of ministry for many years. I believe Fogwell and I began in this ministry some 16 or 17 years ago, or there about. Of course, we had been Christian ministers before that, but at that period, God enlarged our vision of Himself and His purpose. Personally, I received my ministry in the gospel of healing through John Alexander Dowie, a man whom I have loved with all my soul. And though in his later life he became broken in mind and committed many foolish things, so that discredit for a time was brought upon his work, I knew him from the beginning, until the day of his death. I have gone to his grave since I have returned to this land, and as I have thought over that wonderful life, I have prayed in the silence of the night time, “Lord God, endue with the Spirit of God in the measure that you did that life.” I have always regarded it as a privilege in my life and as a unique thing, that after his death I was invited to preach in his pulpit, and I preached there for several months. I remember as I stood on the platform, above my head was a great crown, possibly eight feet in diameter. It was made from boots with iron stirrups on them, thick soles, and all that character of thing that had come from people who had been healed of short limbs. Can you wonder, as I stood in that place and looked around those walls, and saw plaster of paris casts fastened on the walls, some of which had come off my own friends who had been healed, iron braces that cripples had worn, cots on which the dying had been brought, one of them, Anna Hicks. That cot was fastened to one of the walls above the gallery. And I thought of the day when she was carried in, practically dead, and that old man prayed for her and she was healed. The company of other students who had lovingly escorted her to the station at Berean, Kentucky, said to me, “We carried her as if we would if she had been dead, as pall bearers, and we received her back as from the dead.” Her friends cabled her and telegraphed from all over the world, and she gladly told her story, the wonderful story, almost the same character of story that our Brother Zienke told you this morning, of the wonderful love of God, the tenderness of Christ, that mankind has not known, of Jesus the Healer still. Beloved, there is a deep passionate yearning in my soul, that above all else, this congregation may set forth to the praise of God such a character of righteousness in God, such a purity of holiness from God, that this people may not only be recognized in this city, but throughout the world, as a people among whom God dwells. Beginning this work, as I do at this time, I want to say that I do not come as a novice to this time of my life. God has permitted me in the years that are past to assist in the establishment of two great works of God, each of them on a new plane in God. I trust, blessed be His Name, that in the calling together once again the people of God, that it shall be to establish a work on a new plane. Indeed, a higher one than our souls have ever known, where the radiant purity of the holiness of God shall be shed forth into the whole world. And I believe that is God’s purpose. Jesus, Himself, stood at Nazareth on an almost similar occasion. He had been raised in one of the country towns. He had disappeared from His community, gone down to the Jordan, and had been baptized of John. The Holy Ghost had come upon Him and He had returned to His own home town, to the synagogue where He had worshipped as a boy. One thing I have always praised God for is that when God put me into public ministry, He made me start in the very town, the very community, next door to the very house where I had been raised. When a man fights out the battles of life in his own community, in his own home town, among his friends and neighbors, and receives love and confidence from them, I always feel he has received a good preparation for the next step in life. Jesus knew the place for a man to begin to serve God when He said to the demoniac of Gadara, who was delivered, “Go home to thy friends, and show them how great things the Lord hath done for thee.” (Mark 5:19) If your wife does not know you are a Christian, nobody else will be likely to. If your husband does not know you are a Christian, it is a poor testimony. It is the woman that is with you, who eats with you, and sleeps with you, that will know whether you are a child of God or not. It is the man who lives in the same house with you, and the people in your community, who will know best how much of the life of God radiates from your own soul. So Jesus stood in His own home town of Nazareth, and read this wonderful text that I am going to read this morning. It is known, or ought to be, as the platform of Jesus Christ. Jesus Christ has an anti-poverty program. That is the first duty of every child of God and every Church of God that ever came into existence. And the Church that fails in that duty to mankind has failed in the first principle, and has denied the first principle of the platform of the Son of God. My heart has never gone out in sympathy to a body or Christian people who became a little clique, and represent a certain select number of society. My conception of the real Church of God, is one where rich and poor, bless God, alike feel at home. Where there are no barriers, and no boundaries, but where soul flows out to soul, and in the larger life, man knows only man and God. Blessed be His precious Name. The ministry of the things of God must ever be without money and without price. My soul could never descend to the place where charges are made for the services of the minister of the gospel of Christ. Never, Bless God! It is our privilege to make possible a ministry to the people without money and without price, bless God. The magnanimity of the Lord Jesus Christ has stood out as blessed and wonderful feature in all His ministry. I have sometimes wondered how many people really knew how the Lord existed during His own earth life. The Word of God gives us one little hint, in these words, “Joanna, the wife of Chuza, Herod’s steward, and Susanna and many others, which ministered unto Him of their substance.” That was how the Son of God was able to minister without money and without price to mankind. We today have that privilege, too. It is ours. I have faith in God that this Church will demonstrate Christ’s ministry to the poor. For ten years God has privileged me to preach the gospel without salary, without collections. I never asked a man for a cent in my life, and I have lived, Bless God, and been able to minister everyday. God has met me every time, and I believe He will meet every other man and woman who will likewise put their trust in God and go forward. The second plank in the platform of the Gospel of Jesus Christ is this: “To heal the broken hearted.” There are lots of them. I tell you, since I have been in Spokane, the Lord has let me into the homes of the rich and poor, and it is not in the poor districts that you find all the broken hearted by any means. “He hath sent Me to heal the broken hearted.” That is the ministry of this body. If there is a broken hearted soul in your locality, you are the one, who in the Name of Jesus Christ, has the privilege of ministering in the things of God to that soul, broken hearted because of sin, broken hearted, sometimes by sickness, broken hearted because of the conditions around them that they seem unable to control. When I see the living God, in His tender mercy, touch one and another, and make them whole, whether in spirit, in soul, or in body, I rejoice equally in either case, for what God does is always good, and worthy of praise. I regard the healing of a man’s body to be just as sacred as the healing of his soul. There is no distinction. Jesus made none. He provided a perfect salvation for mankind, all that man needed for spirit, soul, or body. So this ministry, bless God, will be a healing ministry. This church will be a healing church. This will be a church to which you can invite your friends who are ill, and bring them here, and help them. I trust after a time we will be able to bring the people in great numbers, the sick who are on cots and stretchers and crutches, that the Lord Jesus, through this church and its ministry, may make them well. It is my purpose that a number of brethren, who have had this same burden on their hearts for many years, as I have had it, may come together in this city as a headquarters, and that from this city we may extend this ministry throughout the land and unto the utter most parts of the Earth. 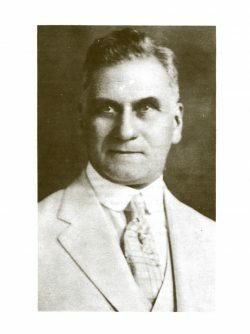 I have particularly invited my old preaching partner, Brother Cyrus B. Fockler, of Milwaukee; my dear, precious brother, Archibald Fairley, of Zion City, a prophet of God and one of the anointed of the Lord; Brother Bert Rice, of Chicago; my dear Brother Charles W. Westwood, of Portland, Oregon; and Brother Fogwell, to assist me in this ministry. Brother Westwood visited with me a few days, and is now going on to Chicago to make the necessary arrangements. This is the outline so far as God has made it clear. This is to be a healing church. Everyone who has been called to this ministry and those who will be called in the future will minister to body, soul, and spirit, through the Lord Jesus Christ. The third plank of the platform of Jesus Christ is this: “To preach deliverance to the captives.” How many there are! One day, not long ago, I received a call from a lady in one of the missions, saying that she had a man there who was a terrible drunkard. Every once in a while he would get delirium tremens. He saw devils; he was haunted by them. The lady said, “We cannot do anything for him. We thought perhaps you could help him.” He came up to see me. He sat down to tell me about himself. Right away I could discern that he was a soul who from his very birth had been gifted with spiritual sight. But instead of associating in the spirit with angels, with God, with Christ, all his spiritual association was with devils, demons, horrors, until that to escape from that condition he had become a drunk from his youth. In order to have relaxation for a time, he had paralyzed himself with drink, and that was his difficulty. I said to him, “My son, kneel down. We are going to pray to God.” And I prayed that God would bind every last demon and lift his soul into union with God, and fill him with the Holy Ghost, so he might associate with the angels of God and become a new man in Christ, and have fellowship with the Holy Spirit. In a few days he returned and said, “Oh, brother, it is all so new, so different. As I walk along the street there are no more demons, no more devils; but as I came up to the church today an angel, so beautiful, so sweet, so pure walked by my side. And, Brother, there He is now, and He has wounds on His hands and on His feet.” But my eyes were dim; I could not see Him. I presume they were like the eyes of the servant of Elisha. “To preach deliverance to the captives” from all kinds of powers, earthly and sensual. It is the privilege of the real church to bring deliverance to the captives of sin, of disease, of death and hell, not only proclaim the message of deliverance but exercise the power of God to set them free. Among the blessed healing of the past few weeks is one dear soul, who is not yet completely healed, a blind woman, whose eyes have gradually opened day by day from the first morning of prayer, and who will be present with us in the near future, as Brother Zeinke was this morning, to praise God for her deliverance. “Recovering of sight to the blind.” But there are many blind hearts, blind minds, blind souls, just as well as blind eyes, who do not see the beauty and power of the things of Christ. And to them we bring today the message of our Christ. “Recovering of sight to the blind.” I pray above every other thing this church will be a church that will know God so intimately that when men come in contact with anyone of us, they will feel that they have met one of us, they will feel that they have met one who is able to reveal the Lord Jesus Christ to them. I believe that it will be so. There are the bleeding ones, the bruised ones, those who have been hid away, and those whose life has been made a burden. May I tell you this incident? The last night I preached in my tabernacle in Johannesburg, they brought a young man with whom life had gone so very hard. He had lost hope and gone into despair so that he tried to blot himself out by committing suicide. He shot himself in the mouth, and the bullet came out the back of the head, strangely, without killing him. This left him with a violent pain in the base of the brain, that caused him to suffer untold agony, and his neck was rigid. This night the greatest part of the congregation was composed of Cornish miners, whom I have regarded as the hardest men I have ever met in South Africa. They live a very hard, terrible life. They dissipated terribly. This man came up on the platform to be prayed for, and I wanted the sympathy of the people. So I made a plea in some such words as these: “Here is a poor fellow with whom life has gone so hard that he tried to blot himself out, and in his endeavor to do so, he shot himself, with the result that he is in the condition you see him in.” Presently, I began to observe that up from the audience there now came a wave of loving sympathy. I put my hands on him and prayed, and the power of God came down upon him and instantly the joints became loose, the neck pliable, the pain gone. Down in the audience that night was one of the most cultured gentlemen it has ever been my privilege to know. He raised in his seat and reverently raising his hands, he said, “My Lord and my God.” He had not been a Christian, but he saw a new vision of the love of God for man that night. Away back in the audience, another soul was touched. He was a different type of man. He came from a different environment. He raised up and slapped himself on the hip and shouted, “Bully for Jesus!” It came out of the depth of his soul. Beloved, it is my conviction that the purity of Jesus Christ and the radiant holiness and the power of God will manifest Christ alike to the cultured and the uncultured, for both hearts are hungry when they see the living Christ. Not next year, not in five years, not when you die, but a present salvation, a present healing for spirit, soul and body. Blessed be His Name. All you need, bless God, is to bring your whole being into perfect harmony with the living God, so that the Spirit of God radiates through your spirit, radiates through your mind, and radiates likewise through your body. Blessed be His Name. Among the most precious privileges that is given to the real church is to be, not in word alone, the Body of Christ. The Word of God speaks of “The Church”, which is His Body. And as God, the Father, manifested Himself through that one beautiful, holy, purified body of Jesus Christ, in such a perfect manner, when men looked upon Him they did not see the man Jesus, but, they saw God. Then He ascended and sent the Holy Spirit to the Church, to you and to me. What for? That the new Body should come forth, and the church, the real church, united to God and filled with the Holy Ghost, should manifest God again to mankind through this Body. That church is made up of all that are written in the Lamb’s Book of Life.